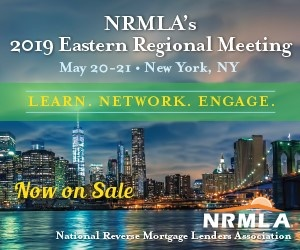 The Board of Directors for the National Reverse Mortgage Lenders Association (NRMLA) has elected its co-chairs to serve from now until the next Annual Meeting, scheduled to take place from November 18th-20th, 2019. Reza Jahangiri of American Advisors Group (AAG) and Scott Norman of Finance of America Reverse (FAR) were unanimously elected. Jahangiri is the founder and CEO of AAG, and first ascended to the NRMLA Board of Directors in 2013. He has been serving as co-chairman since first being elected to the post in 2014. Norman was first elected to NRMLA’s board in 2012, and serves as FAR’s VP of field retail & government relations. He notably advocated for an amendment to the Texas state Constitution to authorize the practice of reverse mortgage lending within the state in 1999, and more recently played a role in advocating for the addition of reverse mortgage for purchase loans to the allowable offerings in the state, which required legislative action and voter approval. In addition to the new Co-Chairs, the association also elected officers Jason McNamara of Celink as Vice Chair; Jim Cory of Live Well Financial as Vice Chair; Mike Kent of Liberty Home Equity Solutions as Secretary; Mike McCully of New View Advisors as Treasurer; Joe DeMarkey of Reverse Mortgage Funding LLC as Chairman, Executive Committee. The Board also added five new directors including Harlan Accola of Fairway Independent Mortgage Corporation in Marshfield, WI; Terry Connealy of Mutual of Omaha Bank in Omaha, NE; Scott Harmes of C2 Financial Corporation in San Diego, CA; Elly Johnson of United Northern Mortgage Bankers Ltd. in Levittown, NY; Jim Miller of Champion Mortgage in Irving, TX. At the 2018 Annual Meeting in late October, the Board shared its priorities for the reverse mortgage industry, including membership advocacy, government communications with members of HUD and Congress, and finding further ways to protect the Mutual Mortgage Insurance (MMI) fund.